Eat Your Food In A Hot Sizzlin' Plate! @ Sizzlin' Steak - Glendale - EAT WITH HOP! How do you like your steaks? Sizzlin`, right? Disclosure: I visited Sizzlin' Steak as a media guest. No worries though because all opinions are my own and won't be swayed. I've been seeing Sizzlin' Steak all over Instagram so I was especially excited to try this place. I had no idea that it's located inside the food court at Glendale Galleria Mall! On one of my days off, I ventured out all the way to Glendale from Orange County. It took about an hour to drive there but was worth it because Glendale Galleria and the shopping areas around are legit! I totally felt like a tourist while exploring the area. This mall has so many shops and restaurants, places that would give me reason to even go to the malls these days since I love window shopping but am tired of the same ole` similar shops back home. Best of all, parking is free at this mall! And you can leave the vicinity and walk over to the nearby shopping area surrounding the mall like Americana at the Brand. Sizzlin' Steak is located on the 3rd floor at Glendale Galleria by the Bloomingdale's Wing. How to order? Easy Peasy! Just choose your steak! Or more accurately, the protein you want on your sizzlin' plate! Of course they have steak, but they also offer tofu and salmon along with ribeye, porkchop, and beef! Ribeye is the most expensive at $15.89 with Salmon following after priced at $12.99. Everything else is just $9.99! So basically you just choose your type of meat and side! I decided to also get one of their appetizers because it looked too yummy in the menu photos! Who orders pasta at a sizzlin... STEAK place...!? MEEE.. I somehow was craving a chicken alfredo pasta and they had it! It's also part of their new menu so I thought, well ...why not! Let's try this! It was interesting to see how after they cook everything, the dish is kinda.. well... cooked again on the plate with a dome lid covering the top so that the alfredo sauce would melt even more when put together. I guess you can safely be assured that the chicken is fully cooked! Yummm! Are you starting to crave pasta now? Just look at these pics! 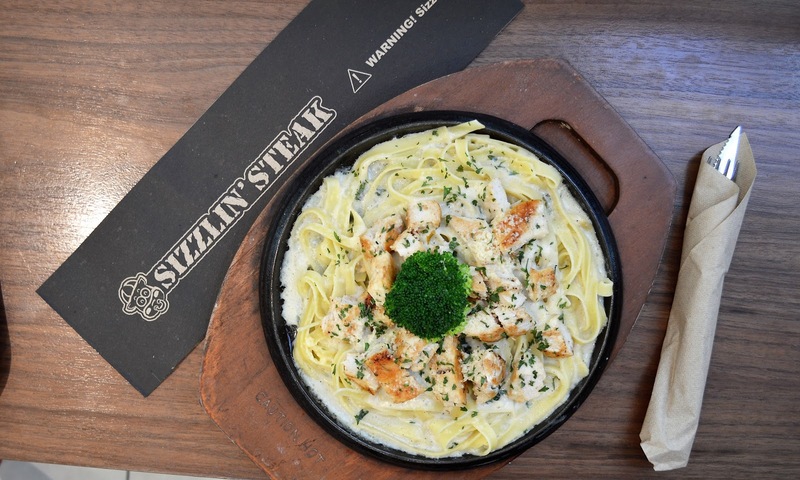 Sizzlin' Pasta is a new part of their menu which includes Chicken Alfredo, Salmon Pesto Pasta, and Sizzlin' Beef Stroganoff. I got the Chicken Alfredo! I thought it was funny how there was just one brocolli. One little mini green tree, the only vegetable of this entire dish that is supposed to cancel out all the fat and calories. Aside from the usual soda fountain they have with typical drinks such as Coca Cola, Root Beer and Iced Tea, Sizzlin' Steak makes it a little extra by offering ice cream to go with your soda to make it a float! The staff is friendly and will explain how it all works if you're lost on the process! I somehow thought it was an actual full-fledged restaurant whenever I saw pics of this place online so believe me, I was shocked to discover that it's more of a fast-casual food court dining option at the Glendale Galleria mall. Nonetheless, the quick and casual environment let me focus on the more important stuff, figuring out my next shopping stop! But really though, don't expect too much here. It's more of an order your food at the cashier and pick-up kinda place, nothing too fancy. Pricing is fair. Most things are $10 here while some other more high-end stuff is around $15. For the price you pay I'd say is quite average for what you get. Maybe a bit pricier than if the restaurant was not inside a mall, but not too big of a deal. →The Chicken Alfredo Pasta I ordered costs $9.99 which is reasonable for the amount! I was so full 3/4 of the way that I couldn't do it anymore. I COULDN'T DO IT ANYMORE LOL. So I struggled to at least eat all of the chicken and the one broccoli. 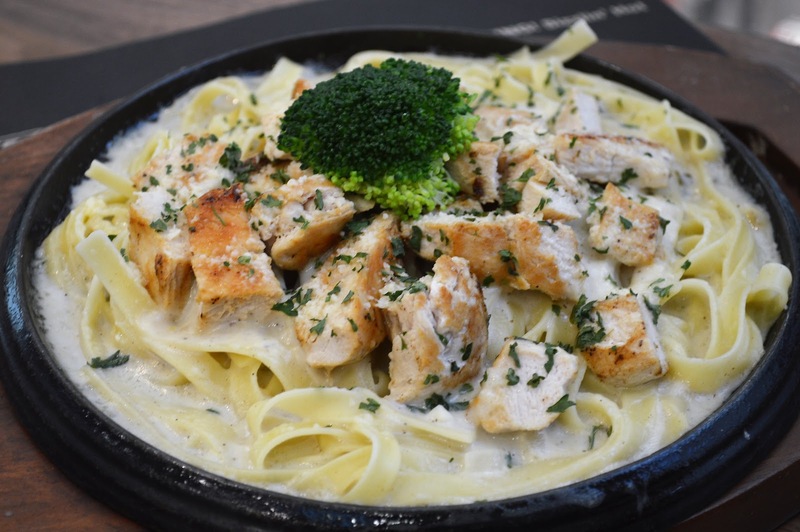 The closest that I can compare this dish too is (hope it doesn't sound too bad) BJ's restaurant or any typical chain restaurant that offers chicken alfredo. Why? Because although it was filling and good overall, I certainly wouldn't consider it gourmet or anything more something more like heated up? However, it does taste better than those typical American chains. I'd rather order the chicken alfredo here at Sizzlin' Steak because the portion is big and you actually get a lot of chicken! Definitely something you should share! The chili cheese itself was delicious but the nacho chips tasted like something store bought and were very salty. Luckily, the chili cheese itself wasn't that salty, but just right, but the overwhelming saltiness from the chips killed it for me. 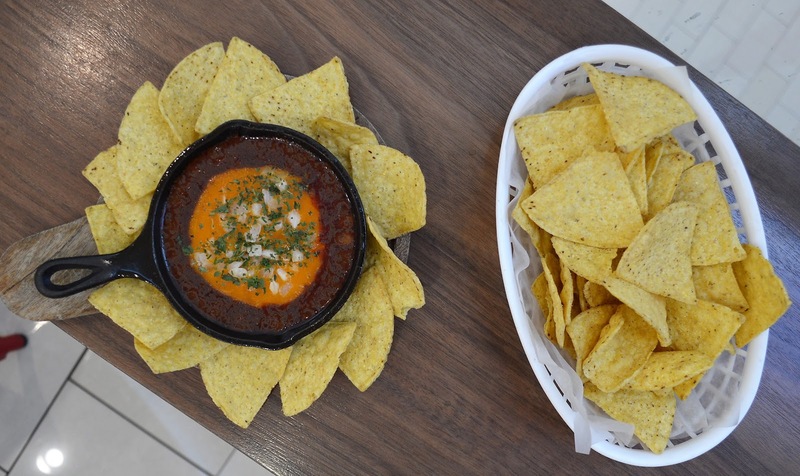 You'd have to dip a full chip to offset the saltiness. Get this if you just happen to be craving a soda with ice cream! But keep in mind that since this restaurant is in a mall, there are many other dessert options as well! Apparently, you can also order online! Check it out here.